Over the years I have come across people who are eager to share with me their knowledge on martial arts. Many times I hear people say something along the lines of “oh you do Kung Fu I trained for a few years when I was younger.” I have also been in conversations with people who will tell me that kungfu junk doesn’t work, that if you wanna learn real fighting you should start training in some MMA (mixed martial arts). Learning the art of hand to hand combat is more than just knowing a few techniques and conditioning the body to take punishment. Indeed that is part of it, a really small part of it. The journey to self-discovery is a long and winding road. My Sifu once said to me that Tai Chi is one of the more superior fighting arts. For years I was like YA RIGHT! Seriously how can a art that promotes softness stand against a Sherman tank? After thinking about it for a few years, I finally realized I could just go around it. Next time your teacher says to you it will take 10 years for you to even begin to understand, take them seriously. I didn’t believe that myself, but looking back on just about 20 years of actual martial arts training, I would have to say he was sugar coating it a bit. I am hoping that maybe I will figure it out in the next 10 years lols… It’s cool though because I am enjoying the journey. 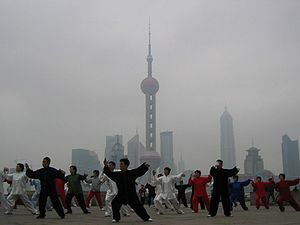 Qigong is a general name for the systems of hardening and improvement of body and mind, treatment and health enhancement created in China. They.